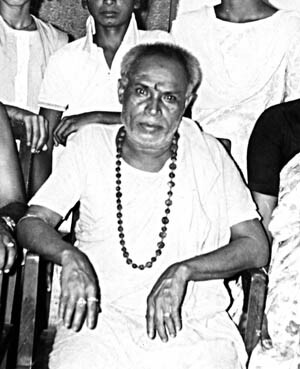 In the early sixties Mrs. Nellie Hart, Brahmamayi, had asked Baba about his life and how he had gotten to the extraordinary state he was in. In turn Baba asked Pranab, a long time devotee, to write the story down in English for Mrs. Hart. At left is a picture of Baba which must have been taken at about that time. The Himalayan task and the colossal responsibility given to me by Sri Sri Prahlad Chandra Brahmachari have made me vibrant with two-fold sensations. The first one is that I am quite unworthy of all means, to cover up his estimation; while the other one is that I feel elated, peak-high, only to hear from him that I possess the proper qualities within me to explore into his life sketch. I bow down to him and to the Feet of the Lord in order to have the blessings to complete the sacred task. I do not take his name on my lips. I usually address him by one word as "Thakur" which means somewhat super-human type of personality. Hence, I write herein as Thakur while writing about him. What I have watched in me, and in the case of the majority of incidents concerning me, that, whatsoever that would happen in the near future will have the proper significance, either by means of certain actions or through certain information, long before the actual point of intersection. That is, it becomes exactly like a rehearsal prior to a theatrical performance. It is no use telling all those here. This much will suffice in order to supplement my views that long before Thakur was introduced to me by one of my relatives, I could actually be introduced to him by a most queer way. Our actual introduction took place on 5th January, 1956. But, the typical type of introduction which had lasted only for a period of a couple of minutes happened at a most odd hour of a night in the month of July of the year 1952. From the 1st June l952 until the 20th June l953 I was really so very fortunate. It was during this period when I used to have a trance-like state within me. Belonging, as I am, to the most ordinary fold, what made me achieve this marvelous state is as yet unknown to me. But, at the dead night of the 1st June, 1952, I could feel all on a sudden the first impulse of trance in me. Its a very dignified process absolutely of its own. It is a fact, that, unless that particular phenomenon sets in the core of the heart, there is the least probability of being within the region of trance. Only the Yogis (Monks of the highest order) have the hold in them to create the atmosphere with a view to being one with their Self. Why I was granted this scope within me is really a very surprising note. Anyway, since that day and up to a period until my meeting with the Thakur I had the sanctioned privilege to unfold my own mind at my will. Always it-used to break upon within me after the midnight. I did not exert any extraordinary means to achieve it, neither had I any direct source to take lessons in this field. It was absolutely an automatic hit within me during all those days. And, in the month of July, 1952, in the dead hour I could experience as well as see the effect in a way that out of my own body, a man, in the form of a Sanyasin (monk) all on a sudden came out and squatted by my side likewise I was beseated. What a sweet smiling face with all the divine touch he had over his countenance and body. There was no exchange of words there. That way he stayed for a couple of minutes. All the time he kept himself, attached to me, at a 90 degree angle. I enjoyed the bliss for a period. Finally, he again vanished within my own body. That was all the experience that I had that night. The best is hidden inside. In the case of this earth where we live in all her treasures are lying below the rocky strata. It is difficult for the ordinary eye to ascertain her treasures from over the surface. But, the eyes of one who knows catches the glimpse and understands the actual opulence hidden within. Thus the mines all over globe, so far known, could be discovered. I got the stage of exploration within me. Alas! I had not the proper iota of justification and hence I could not grasp the implications of all those stages with which I was being hovered over. The valuable mines within my innermost core could not be tapped by me although I was being given enough signals. It was on the 20th June 1953 I got married. The serenity of my life was there no doubt. At ease and at my own will I would get the vision of the other world. But, the urge to see the things within gradually was getting on its wane. This much was the fact that the faculty I had developed in me remained a matter for me only. With a married man like me the charm and the essence for the trance got coloured into insignificance. Why it became a fact for me and my house to get the presence of the Thakur within our fold? May I say, that, from the financial point of view we happened to belong to the series of the middle class. By the year 1954 it could be seen, that, our existence within the rank of the middle class was shaking and towards the worst category. It was at that time when one of our relatives wanted us to contact the Thakur. Also, Thakur, was once apprised of the fact; but, he stalled off our meeting with him for the time being. It is no use suppressing the truth. We forgot about him also. The downfall within our daily life was taking its toll at a rapid pace. Waves of misfortune dashed us to the bottom and I had my dissension with my partner in my business career. The sordid end finally led me to detach myself from my all activities. Cut off from all activities I had no other way but to sit idle within the four walls of my small room. I became a prisoner in my own house and remained in that state for a period of long 14 months. All our earthly projections got stuck up within the span of our small house. So long as we had that somewhat bright days, we had all our relatives and friends incessantly pouring in. But, with the setting in of our black days all vanished like camphor. The family tradition sustained us and all the spectres of sorrow and misery were there only to tarnish our health and complexion, but did not rob us of our mind. My two unmarried sisters were blossoming to the dust and the ebb tide pronounced its effect on the very youth of my sisters. Whatsoever, my mother and the two sisters did not forget to maintain their devotional spirit within their heart. The elder amongst the two sisters had developed particularly a manifold vibration within the region of devotion and her faith in Goddess Kali was superinscribed to the greatest extent. The sad episode in our daily living state had made her faith in Goddess Kali firmly set up to such an extent, that, ultimately she could score her self to the pot-hole of the inner self. She got submerged to that hidden state by the month of December 1955 and remained well blended there for a period of long 12 days. What an influence of the Omnipotent over her own small self! All her earthly ties with us got within the shell of her mind. She would not speak with us, neither would she respond to our call. The Mother would talk to her and she with Kali, vice-versa. In her own body she started playing double fold. In her own self she was as she is; but, while in the form of Goddess Kali she would draw her tongue out and speak in that manner as is symbolized. We got frightened over the issue. In the first two days of that state she had a manner of calmness all over. All our efforts to get her back to normality became of no avail. But, on the third day she broke her silence. We had no place to express our deep sense of joy. For a period of 48 hours she had no foodnot even a drop of water could be administered to her. Surprisingly, we had noticed that the tip of the tongue had been drawn within. Nevertheless, she broke her silence but it was all solely for her own cause. Although for the last two days she was lying on her bed, yet, in that state in a most normal way she started doing her pujah with the proper feats. All the while, she chanted the hymns in Sanskrit language distinctly. 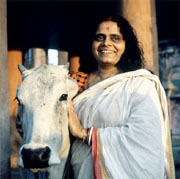 That continued for more than 30 minutes, and as usual she started singing the devotional songs. Hardly we had been pleased to see her normal condition than we could be caught up by a note of dejection. Soon we understood that she had again gone back to a world unknown to us all. At times, she was laughing and again she would be weeping, or at best she might be talking in two different voices. One was in her own manner and the other voice was that of the Goddess Kali. We were outwitted to think out the best course open for us all. The moment we discussed about calling in a doctor than forthwith she was influenced by the Mother Herself. We were told, "There is no doctor on this earth to diagnose the case. May you all know that it is only with a very limited few, I, the Mother of the Universe, blend Myself into One. I love you all, but I love your sister most, and hence, she is now staying with Me." What not we had watched during all those 12 days! She proved conclusively that the superimposition of the Force of the Universe means an all-knowing state. In that state with the eyes closed will never mean sightlessness; rather, it becomes "X-ray" eyes. Time and space get intermingled and all the barriers are lost. Manifestation of the Shakti (strength)both physical and mentaleven without food for days together could be watched by us all. However, when all our means to talk with her failed, then, we could find a solution. That is, we started addressing our own sister as "Mother." The clue was out. Our sister, under the influence of the Mother, became a Mother to us for the time and she replied to us. For the rest of the days, until the day of Deliverance, we used to address her as mother and all our nervousness ceased and her blissful state became our source of mirth and gaiety. We do not feel diffident by an inch even to say, that, although we learned that, she was under the mighty influence of the Omniscient, yet we did not pick up any commercial questions relating to our pecuniary hardships and earthly troubles. We were undoubtedly happy to be one in the same stream in which our sister remained at a stretch for such a long period. After she was delivered to the midst of us, as our sister, again, we noticed that still she remained somewhat indifferent. She was free from the influence on 1st January 1956. And, it was on the 5th January 1956, Sri Sri Thakur very kindly consented to come to our house. We did not tell him anything. Simply he had heard all about the incidents concerning my sister. Without giving any prior thought to this story, he simply deduced that all those might be hysteric feat. As soon as he stepped into our house, he changed his views forthwith. At first I did not face him. He tendered his desire to see me. As it was getting late, so, he shouted for me in a most friendly way from the next room. Obviously I had no other option and I rushed to that room. At the very entrance I was caught unaware of; I looked at him and so quickly he had flashed on my eyes his bright pair of eyes. There was no deviation in his looking at me for at least more than a minute. All my motion to rush into the room had already been put to a halt, and it had lasted for a few more minutes in that way because he had attracted me like a magnetic pole. After a while he drew himself down to his natural state. I was asked to come nearby and sit by his side. After I had touched his feet, he touched my forehead and told me on my face that in my living cell I was dead for the time being. Exactly so, I was not in my active state for the last few months. The crash in my business career had made me dumbfound. On being asked by the Sadhu I told my name. But, sharply he pointed out to me "A dead mans story is a by-gone story. Do you like to get a new life afresh? In that case if you are to live, then, you must have a new name." Nobody in the room could follow what he had said to me. He inquired as to why I had stopped practicing my secret works concerning concentration of the mind. Why I did not under-take to have the visions which were bestowed upon me. And, also he could foretell about my deep inclination for the girl I had had before our marriage. All on a sudden the thread of our talks broke down. By that time my sister had entered the room. We found the great Yogi (Sanyasin) was having a vigorous vibration within his temple. I could understand the inner significance of that type of action. For a period of 12 days at a stretch we used to receive that vibration in us. The Sanyasin with his folded hand requested my sister to sit down. He closed his eyes and wanted to ascertain the reason behind the queer atmosphere brought about with her very entrance. He remained in an absolutely standstill state for a good deal of time. Gradually he became a normal man again. Smilingly but with all his keenness he wanted to address my sister as his own mother. With his voice at his softest pitch he said once again, that he had seen his Mother in the body of my sister. After he could establish the fact, then, he wanted to bow down to her feet. This he did in no time. This he does even now. We had been talking for hours together. The dusk was about to set in. He told me simply; "Pranab, you all are heading towards a path at a very tender age in that respect. Do you not toss and tumble in this way. Let the proper time come, then, you all will realize the Mother. Standing on a wooden stool if anybody touches the living electric line, then, there may not be any shock. So, I should do in a way to put this whole house over a wooden base, so that, none of you can get into the region of the Force. Are not you ashamed of the fact that you are not having any means to earn your sustenance?" However, he told me all those words likewise a beloved would advise. All on a sudden he asked me to fetch him a glass of drinking water. In turn, I asked my youngest sister to do the same for me. There again he cast his all sweetness in his voice and made me understand that he could ask my sister himself. As they were sitting on the other side, so, from the point of convenience it would be much easier if I had gone to get a glass of water. That very night I had wanted to get into the world of visions. But where was my power gone? Next day following when we met each other he did not spare to admonish me regard being had to the fact that I had again tried to get into the region of mysticism. Who was he to know everything in advance? Ah! he is really one in all, and all in one. A superman within the fold of an ordinary man. He asked me to surrender my devotion to him. I need not do any worship even so to speak. He stressed that his all devotion would be my devotion. Since then I had to forget all about what I had within me, or what I do not hold with me now. In a very simple language he has made me understand that as we do deposit our money in the safe deposit account in a good bank, similarly, my whole has been kept in a Divine Bank. In due course only I will have the right to get it back. A rich man will remain a rich man only when he has a big sum deposited in a vault. I am happy that I have a treasure belonging to the fold of divinity but kept on a very long term scheme with the agent of The Lord. It is not dead because it is accruing the interest according to the scheduled charter of The Goddess Mother. After I was acquainted with him I was advised by this great Yogi to treat him in a most friendly way. However, in course of a month or so from the date of our acquaintance, one day this Sanyasin came to our house with a shaven head. As and when I could see him in that state, I was lost within the tinge of the remembrance of the past and could trace out that the MAN in my front was that MAN whom I saw once, coming out of own body and who in no time, vanished within me again. I belong to him in and out. I bow to him with all my heart. He is my seismograph because what I do is known to him immediately. It is for Mrs. Hart, who became eager to know, I am writing the life sketch of my Thakur who is by now known to her also. All along I have kept the Thakur in the first person while writing this life story because I feel that Thakur is reproducing his own life, once again, in a form most extempore.